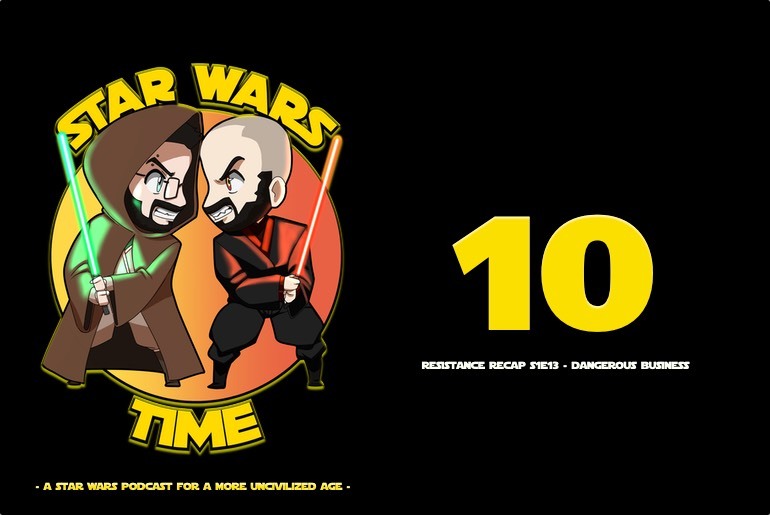 Season one of Star Wars Resistance continued this past Sunday with its 13th episode, which is titled, “Dangerous Business”, so Nick and I fired up the Star Wars Time Show for a new Resistance Recap. Before we get to that cast though, you can also check out our video breakdown of the episode’s Easter eggs and references, as well as our video recap and review of the episode. Naturally we talk all things “Dangerous Business” in the recap, which was a pretty good episode thanks to its climax. This part of the episode not only revealed a bit more of the First Order plot, but it also featured Kaz getting his hero on again. In fact, both Nick and I discuss how different Kaz is starting to feel after the show returned from its midseason break. He’s still a clutz, and a very clumsy hero, but he’s becoming more of a hero than ever before, and I think when everything is all said and done, Kaz will be considered one of the Resistance’s greatest assets. Anyway, tune in above to listen to the conversation, and make sure you hit the Like and Follow buttons on our social media channels, and be sure to Subscribe to our podcast feeds through the links above!